The Pink Star: 59.6 carat pink diamond. Photo from Sotheby's auction house. The previous world record for a pink diamond was set in 2010 by the 24.79 carat Graff Pink which was sold for $46.2 million. The Pink Star diamond also broke the record for all diamonds, a title previously held by the Oppenheimer Blue diamond, sold at a Christie’s auction in May for $58 million. Sotheby's broke records on Tuesday at their Hong Kong auction house with the sale of "The Pink Star" for an astounding $71.2 million. The 59.6 carat pink diamond, was won by Hong Kong-based jewelry retailer Chow Tai Fook after a five-minute bidding war. The Pink Star diamond was the largest internally flawless, fancy vivid pink diamond ever graded by the Gemological Institute of America, according to Sotheby’s. The Pink Star diamond was originally mined in Botswana, Africa, by De Beers in 1999. The stone came from a 132.5 carat rough diamond. The cutting and polishing took two years of work. The gem was previously auctioned off in 2014. 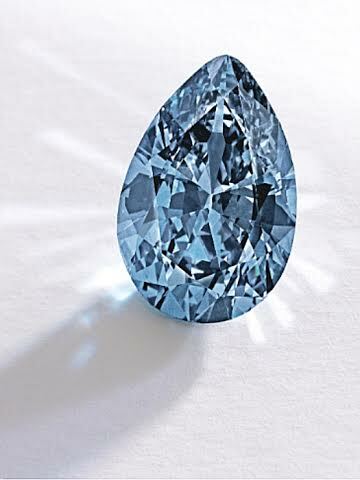 Isaac Wolf, a diamond cutter, purchased the stone for $93 million at a Sotheby’s auction in Geneva. The diamond was then reclaimed by the auction house after Wolf failed to pay for it. Tuesday's winning bidder Chow Tai Fook has renamed it the CTF Pink Star after it purchased the diamond in honor of the late father of the jeweler retailer’s current chairman. On Nov. 20 a 9.75 ct fancy vivid blue pear-shaped diamond hit the auction block at Sotheby's New York. A frenzied 20 minute bidding war between seven people ensued ending with the stone fetching $3.3 million a carat ($32.6 million total), setting a new record for any diamond's per-carat price sold at auction. The price tops the 14.82 carat vivid orange sold by Christie's in Geneva which sold at $2.3 million a carat ($35.5 million total). The diamond has also set a record as the most expensive diamond ever, a spot previously held by the Wittlesbach-Gaff sold in 2008. The blue has been dubbed "The Zoe" by its current owner, A Hong Kong collector who remains anonymous.